Apple & Bee is an Australian owned company that was started two people, Brett Pattison and Claire Morris, who both share a passion for the very best in contemporary environmental design. The aim of Apple & Bee is to produce beautiful, everyday cosmetic, travel, and baby bags without harming the environment. They want to have the lowest possible impact on the environment which is why they are carbon neutral and donate part of their profits to environmental organizations. This adorable giraffe design cosmetic bag is designed to hold all your essentials for a day out and about. It is made with 100% certified organic cotton which means it is nice and safe for your baby. This little bag measures 11.81 x 7.87 inches, but it's the perfect size to hold diapers, wipes and a bottle AND it will fit snugly inside your diaper bag or under your stroller. The inside is lined with the signature Apple & Bee bee design fabric and has a small zippered pocket. "baby stuff" in your regular purse. Follow & Connect: You can Like Apple & Bee on Facebook, and follow them on Twitter and Pinterest. 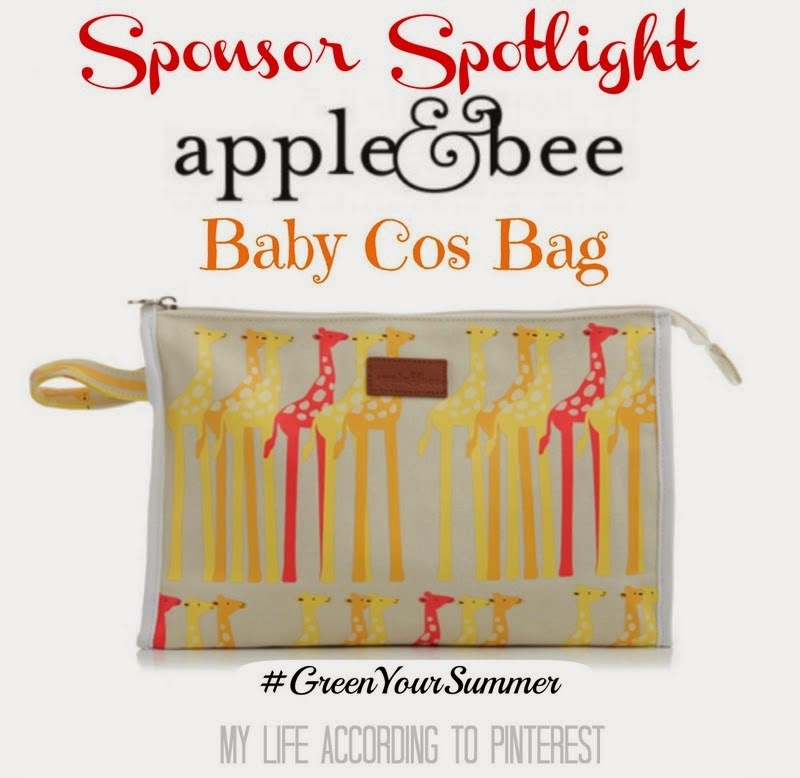 Buy It: You can buy the Apple & Bee Baby Cos Bag on their website for $24.95. 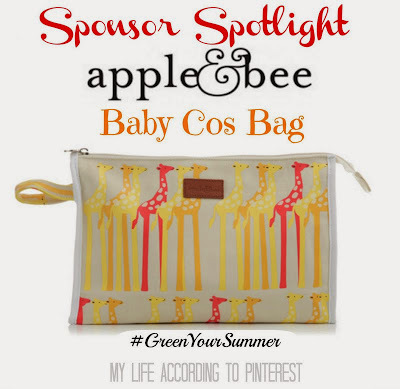 Win It: Come back tomorrow to enter to win the Apple & Bee Baby Cos Bag in Giraffe in the Green Your Summer Giveaway Hop! Wow, that little bag sure does hold a lot of stuff! It's also super cute. I'm coming back tomorrow to try and win it. Thanks for telling us about a great product. That giraffe bag is so cute!!! I love that this is compact and fits so much! These are fabulous! I love it! Wow! Can't believe it fits this much! Would be nice for short trips out when you don't want to lug a big diaper bag around! 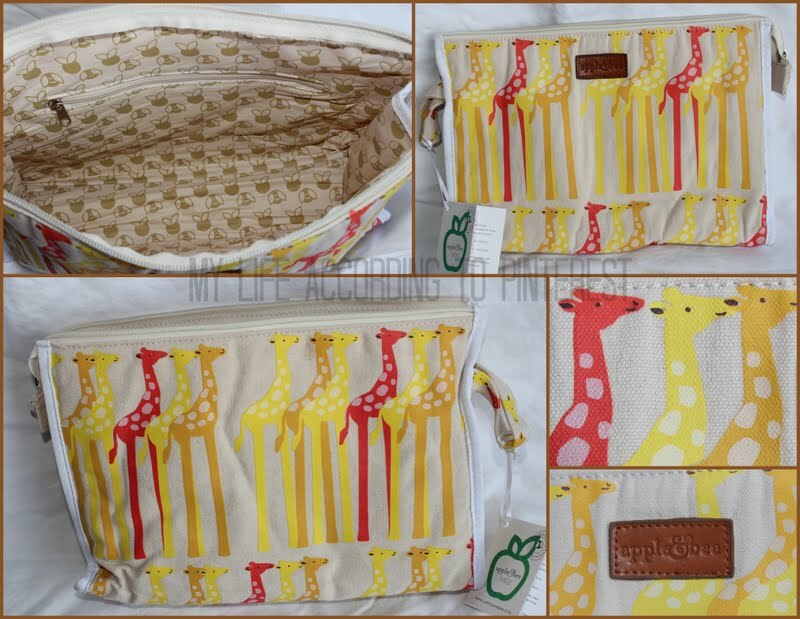 just love the giraffe print-very cute...looks nice & roomy! You definitely know how to pack that bag, I remember just cramming stuff in then having to dig it all out to find what I was lucking for. I think that Apple and Bee has some very nice bags of all different sizes and uses. I do love the giraffe bag and would love to see it. This is super cute! Love that print!! They have so many cute styles and prints! Great that they are eco-friendly too! I love the beautiful print. Sometimes I hate taking such a large bulky diaper bag if we're just planning to go to the park for half an hour. This is perfect! The Giraffe print is awesome! Wow, I didn't realize that this bag could hold all of this! 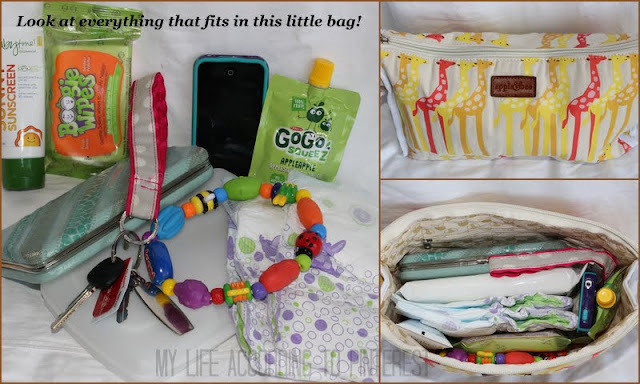 While I don't think it would fully replace a diaper bag, it would be great to have in the diaper bag when you need to do quick changes. I always hated lugging the diaper bag into the bathroom, where it would just land on the floor while I changed my daughter. love that this bag holds so much stuff! sometimes you just want to travel light and still have necessary things to take along, this bag covers it! This bag is a wonderful shower gift for a person having a new baby like my daughter. I know she would love it because it holds many things and packs compactly, plus it is eviro-friendly! I love that the company is carbon neutral AND donates to good causes. And they have AWESOME products!! Wow! This bag holds a ton. This would be perfect for our family. I hate carrying a huge bag but like to make sure I have the essentials. Love this so much. So cute, love that it's organic and the company is carbon neutral! I didn't think it would hold that much, just looking at the picture with it closed! Didn't realize it could hold so much when I first saw it! I love when you get get so much into such little bags! Awesome! This is adorable and would be perfect if you didnt want to carry a huge bag around. Cute AND functional! I love that this bag is just the right size for all the essentials. Love how it is small in size but still able to fit a decent amount of stuff! I often just put a few snacks, diapers and a bottle in a purse instead of using a diaper bag. This looks like it would be perfect if you're only going to be out of the house for a few hours and just need a few things! I love the print, that it looks so durable, and that it is deceptively small. We travel frequently and this bag would really come in handy. I love the print on the inside and outside. This bag would be perfect to carry my makeup/toiletry items in the car for day trips. I really like that they donate part of their profits for environmental concerns. I think their bags are really cute too. this is so cute and i love that it is affordable as well!